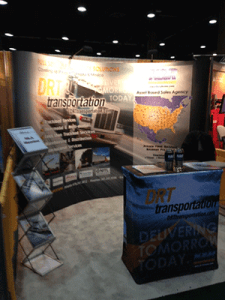 (Orlando, FL) February 20, 2013 – DRT Transportation was again an exhibitor at the RILA Transportation Expo held February 17-20th at the Gaylord Palms Resort & Convention Center, Orlando, Florida. This well attended expo featured Chris Wallace (FOX News Sunday), Laura Sen (President & CEO of BJ’s Wholesale Club), Mike Greenberg & Mike Golic (Mike & Mike Show, ESPN), Jeff Henderson (New York Times Best-Selling Author) and Marci Rossell, PhD. (Former Chief Economist for CNBC) as 2013 Logistics Speakers.